We’ve commented in the past on the irresponsible trading decisions that some of Jim Cramer’s viewers make. Thursday’s episode of Mad Money was a case in point. Shortly into the episode, Cramer told his viewers that there was money to be made in DJO and went on to hit all of his bullish sound effects. As is the case with most of the stocks Cramer recommends, the stock immediately traded up on his recommendation as shown in the chart below. Actually, if you look at the chart closely, you may be thinking that the stock’s reaction was somewhat muted in that it only rose by 50 cents. Afterall, most of the time when Cramer recommends a stock it goes up by more than a measly 50 cents. What makes this 50 cent jump so notable however is that last night’s episode of Mad Money was a rerun from April, and it wasn’t as if CNBC hid the fact that the show was a rerun. 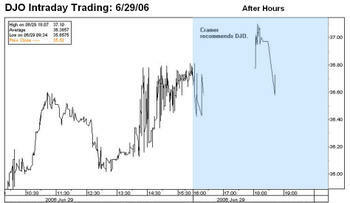 During the entire time that Cramer was recommending DJO, there was a graphic in the lower left portion of the screen which said “Previously Recorded 04/19/06”. In a report sent out to our mini-institutional subscribers on June 3rd we speculated that if the Fed raised rates in June and treasury yields remained near current levels, they would be intentionally inverting the spread between their key short-term rate (Fed Funds) and the Ten-Year Treasury. We also highlighted the following timeline which plots occurrences of intentional inversions as well as recessions. As it details, intentional inversions have been even more reliable predictors of recessions than market influenced inversions. In five out of six of the periods where the Fed raised rates above the prevailing ten-year yield, the economy went into a recession within the next eighteen months, and in the other period the economy was already in what was its longest recession of the last thirty-five years. One timing indicator that we follow closely is the difference between the number of overbought and oversold stocks on the S&P 500. After yesterday's market gains, the spread turned positive for the first time since May 12th. 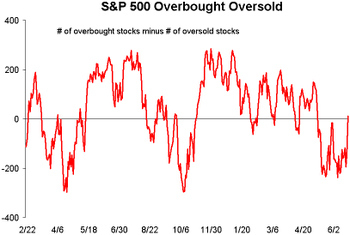 The current number of overbought stocks is 109 while 97 are oversold. A report card for the Internet stock recommendation services -- have they been producing results? The newsletter also includes access to our online Birinyi Stock Ratings service, which ranks 1500 major stocks based on our analysis and also includes our Birinyi 50. As if investors don't have a hard enough time keeping on top of the market, tracking some of the indicators that impact it is becoming just as difficult and unpredictable. One example of this is sentiment. Not only are there several different surveys/polls that attempt to accurately gauge sentiment, but they all vary widely as to their conclusions. The chart below highlights the current status, as well as the range over the last year, of some of the sentiment indicators we track. The chart also shows the direction of each indicator over the last two months. ABC News Consumer Confidence, which was released Tuesday, has shown improvement over the last two months, while the Conference Board's measure of confidence (also released Tuesday) has gone down. While these two indicators are currently at similar levels vs. their range over the last year, the current status of other indicators are literally all over the place. Michigan Confidence, for example, would have to show a large jump in its next release tomorrow to even come close to matching the levels of those two, even though they essentially measure the same thing. 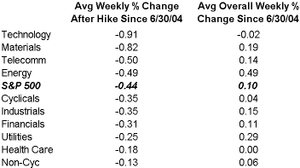 On the heels of the expected 17th straight rate hike since June 2004, we looked at the performance of the 10 major sectors in the week (5 trading days) following the rate announcements during this tightening phase and found that all of them have on average declined. Technology and basic materials have fared the worst while consumer non-cyclicals and health care stocks have gone down the least. The latest results of the Investors Intelligence newsletter-writer survey are as bearish as they've been since October of 2002. 36.3 percent of respondents are bearish, up from 35.6 last week. As a Bloomberg story which quotes Ticker Sense's own Paul Hickey explains, this isn't necessarily a horrible sign. Analysts such as Hickey, who try to predict stock moves based on statistics such as price patterns and volume, often track investor sentiment as a contrarian indicator. A rise in bearishness or a decrease in bullishness may be signs that stocks are poised to advance because investors who view the market unfavorably may have already sold shares. After all, the low point of October 2002 turned out to be the harbinger of a bull market and economic boom. Yesterday's release of May New Home Sales may have been a message to buy homebuilding stocks for reasons more compelling than "the report was stronger than expected." The estimated figure of 1.284 million sales for May appears to have rescued the tally from three consecutive poor months. Coming off April's low total of 1.180 million, homebuilder stocks summarily plummeted; this was no surprise, as homebuilder stocks appear to be directly correlated to the New Home Sales totals. Take a look at the monthly chart below, which illustrates the close bond between New Home Sales and the S&P Homebuilder Group index. The circled area highlights the divergence between New Home Sales and the homebuilder stocks created by yesterday's release. 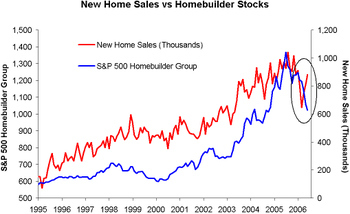 Will homebuilder stocks and the New Home Sales tally suddenly cease to move in tandem? Don't bet your house on it. Because today is exactly five trading days before the Independence Day holiday next Tuesday (the market is only open until 1 on Monday the 3rd, which spells a four-day weekend for a hefty percentage of investors, but it's open nonetheless), we decided to stretch our imaginations and examine what typically happens in the five trading days leading up to the 4th of July. As it turns out, the answer is that the market tends to do pretty well under the typically lighter volume, with the DJIA gaining an average of 0.63% over those five days (going back to 1900). This compares to a 0.13% average 5-day gain for the Dow across the whole calendar. History shows, however, that the market tends to cool off slightly when people get back from their barbeques the next week and start trading again. The five trading days following Independence Day (going back to 1900) yield an average gain of 0.25%, which is still better than normal. 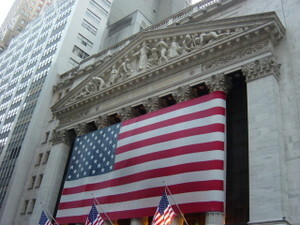 For the record, the last trading day before the July 4th holiday has been very strong, with an average 0.32% one-day gain (compared to the typical daily average of 0.03%), while the first day after the holiday has also been stronger (0.08%) than a typical day. So let's fire up our grills and pull for a strong week and some decent weather. Posting may be a little light for the next couple of days as we work to finish our monthly Reminiscences newsletter due out Wednesday. For everyone who has signed up through Ticker Sense, we thank you! If you haven't signed up and would like to, you can do so at the left of this page. 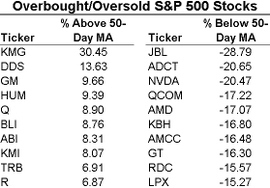 Below we list the stocks on the S&P 500 that are furthest above and below their 50-day moving averages. 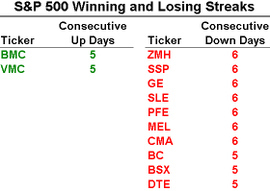 We also list those stocks in the Index that have been up or down 5 days or more.